Chest of drawers, XF129, English, unknown maker, c.1760, mahogany, deal, oak and brass, ©Sir John Soane's Museum, London. Photograph: Hugh Kelly. 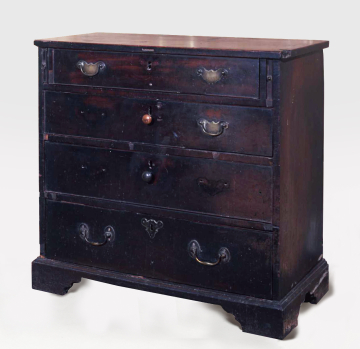 With four drawers (of which the bottom one is the deepest with the others becoming shallower in ascending order), on bracket feet; the top originally with a hinged leaf supported on the pull-out lopers at each side of the top drawer (now missing); original brass ring handle on the left-hand loper; the drawers have solid mahogany fronts with oak backs, sides and bottoms; three of the original flat brass elongated cartouche back-plates with bail handles survive (the top drawer has both original handles, the second drawer one, the third drawer is missing both and the bottom drawer has replacement handles, perhaps of the early nineteenth century); the top drawer retains its original brass lock; the bottom drawer retains its original brass key escutcheon; the middle two drawers have later turned wooden knobs; the chest has a rough deal planked back. 1 At one time Soane’s manservant was required to sleep in the Monk’s Cell to the north of the Monk’s Parlour where his bed is shown, presumably masquerading as that of Soane’s imaginary hermit Padre Giovanni, on the basement plan published in Soane’s 1830 Description, plate 5. However, by 1837 judging from the sequencing of rooms in the furniture inventory the referred to in the inventory is the small room adjacent to the Back Kitchen, which is also shown with a bed in it on some plans.